The design of this paperweight is inspired by the National Galleries of Scotland tartan, the three claret stripes represent the three galleries and the colour is taken from William Playfair's original colour scheme for the National Gallery. This tartan pattern was designed by Dr Timothy Clifford, Director of the National Galleries of Scotland (1984-2006), for the National Galleries of Scotland based on the Black Watch or Government tartan. This tartan was registered in November 1991 in the official Scottish Register of Tartans, Reference STWR and STA No. 2050. The visitor services team for the National Galleries of Scotland wear this tartan as part of their uniforms. Caithness Glass is a Scottish artistic glassware manufacturing company, traditional fine glass-makers since 1961 and were issued a Royal Warrant in 1968. A lovely gift from Scotland. 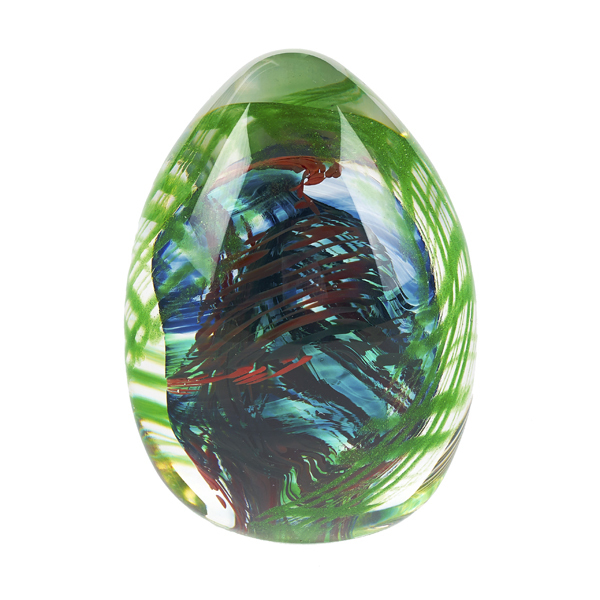 Each paperweight is handmade making everyone unique. Each paperweight comes in a presentation gift box with the Caithness logo.